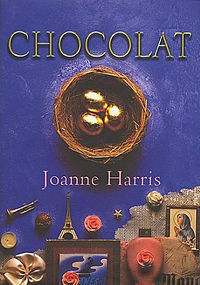 Retro Review: Joanne Harris' "Chocolat"
Home » books » retro review » Retro Review: Joanne Harris' "Chocolat"
Here is one of those books that I've been meaning to read for ages. My Mum has repeatedly suggested it, perhaps knowing that I would love the sensual descriptions of Vianne's chocolate shop set against the backdrop of a small village in France. Well, she was right. Chocolat tells the story of Vianne Rocher, a stranger who arrives in Lansquenet with her small daughter on the last day of the carnival. It is not long before Vianne is causing a stir as she opens up a chocolate shop just as Lent begins. This causes an unruly war in which Vianne must battle the prejudices of Father Reynaud and his obliging flock of villagers. This book is quite simply, delicious. It's been quite some time since a book has grabbed all of my senses-sight, smell, touch, taste- Harris' prose is vivid. The value of this book is not merely in the style, but in the wonderful characters she creates. Vianne is lost, struggling to make a home for her and her daughter, having spent her own life being shifted from city to city with her wayward mother. While Vianne's story is about discovery, it is also about coming to terms with the loss of her mother. Amidst all this, there is the suggestion that Vianne's history is not as simple as she believes (I'll avoid spoilers). Alongside this, Father Reynaud struggles with what he perceives to be the seductive influence of Vianne and her chocolates. As he struggles with his own temptations, questioning his faith at every turn, revelations from his past allows the reader an insight into his insecurities. Harris' characters are complex, and the novel is nuanced. A true pleasure to read. I can't wait to read my way through more of her work.